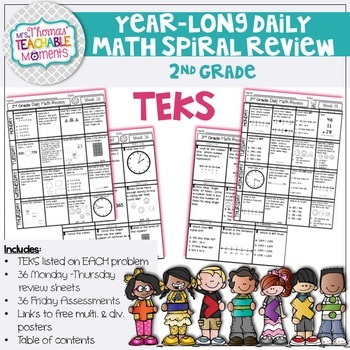 This is a year long, spiral review of the NEW Math TEKS. Daily Math Review begins by reviewing 1st grade TEKS, then moves to 2nd grade TEKS. 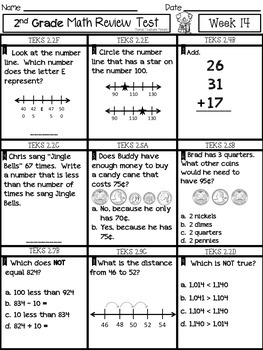 It is aligned to the 2012 2nd grade TEKS. Each 2nd grade Math TEKS is reviewed over the course of 36 weeks and can be assessed at the end of the week with a coordinating assessment. I find this review worked best when my students worked on the daily practice independently for morning work. Then, during the first few minutes of my math block, I quickly review how to work each on and have the students make corrections on their own papers. The purpose of a spiral review is not to use it as a teaching-piece. These are skills students already know, you are just reviewing them to keep them fresh in their minds. Remember, if you don’t use it, you lose it! 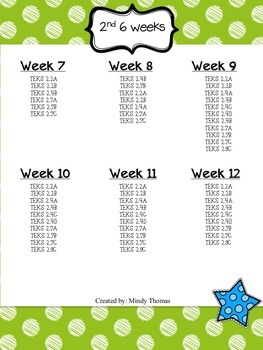 Each week is numbered so you can keep track of which one you are on. Then, each week has it’s own little picture at the top on the Monday – Thursday practice, and the picture matches the Friday Test. 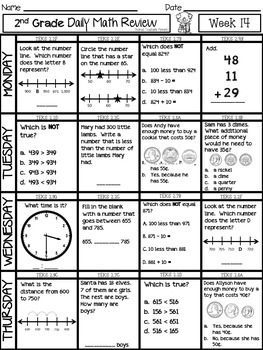 At the beginning of the week, pass out the Monday – Thursday practice sheet to each student. Choose a time in the day for your students to do the four practice questions each day, and then a time to quickly review the answers with them. I have my students keep the sheet all week in their folders that stay at school so that each day they take it out and work on it. After we go over the answers for the day, they put them back in their folders. This takes practice, but I PROMISE, they do begin to keep up with them on their own! But you can choose to keep up with them however you choose! My students come in each day and work on them for Morning Work so that it doesn’t take up much of my math block at all! A few weeks into school, I don’t even have to ask them to get it out and work on it each morning. It is routine, they just come in and get it out. It’s marvelous! On Friday, students take an assessment that goes over the skills practiced all week. This could also be used as homework. The first few weeks review 1st grade skills. The rest of the year is over 2nd grade skills, but the last 6 weeks focuses primarily on the Readiness Standards. Check my blog for more ideas and ways I use my products! Be in the know about sales and freebies by following me on Facebook and Instagram! As always, feedback, suggestions and comments always welcomed!